L. Schmidt / B. Curley 27 72/36 7404 25 minutes from downtown. After staging the Honda LPGA Thailand 2007 at it’s Old Course, Siam Country Club has opened the new 27-hole golf course, called Siam Country Club Pattaya Plantation. The three nine-hole courses, named Sugar Cane, Tapioca, and Pineapple, are designed by Schmidt-Curley Design Inc.
A unique club-house on the top of the hill, with stunning sceneries of the golf course and its surrounding area, offers excellent facilities, including a superb restaurant and high class service from the staff. 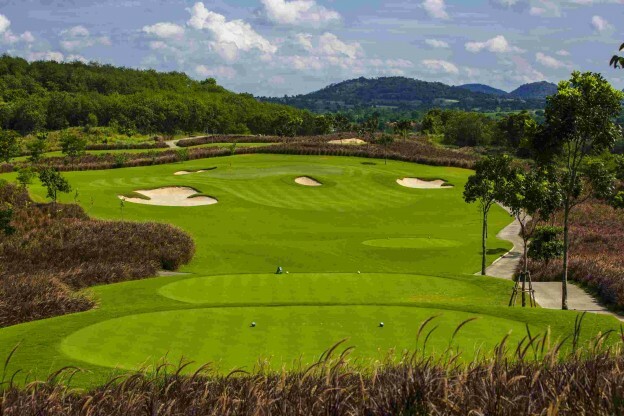 Siam Country Club Pattaya Plantation is a must-play golf course for everyone visiting Pattaya.